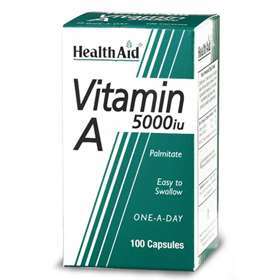 Health Aid Vitamin A 5000iu is a daily supplement to supply you with the amount of vitamin A you need. Vitamin A support healthy eyesight, strong cell membranes, tissues and organs. It can also promote healthy growth, strong bones, healthy skin, hair, teeth and gums. Health Aid Vitamin A may be beneficial to those with eye disorders, recovering from surgery or have skin conditions. Free from yeast, gluten, wheat, starch, dairy, lactose, sugar, salt, artificial colours, preservatives and flavourings. Supports healthy eyesight, cells, tissue, organs, skin, hair growth and more. Suitable for adults and children over 12 years of age. Take one capsule daily with food. Adults may take up to two capsules daily if required. Do not exceed recommended daily dose unless advised by a suitably qualified person.